I scrapbooked out of order! What is this world coming to?!? But I like it anyway. Not my favorite layout, but it makes me laugh, so that's good. Pros: They cook their steaks at 1600° (kind of cool ... er, hot). You pick exactly the cut of meat you want with whatever appetizers, salads and sides you want. The food was very good. Cons: VERY noisy. Bit snooty. Drunk people (although can be a pro if they’re entertaining). Took 2 hours without dessert. And then we got the check. $109.91. BEFORE tip and without dessert. Oy. 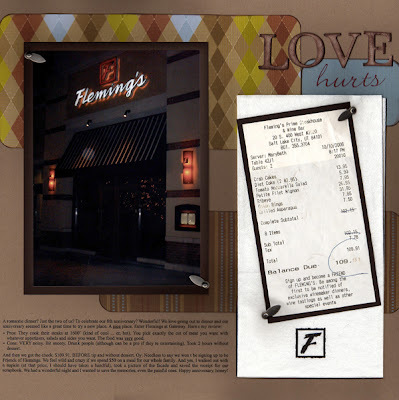 Needless to say we won’t be signing up to be Friends of Flemings. We feel wild and crazy if we spend $50 on a meal for our whole family. And yes, I walked out with a napkin (at that price, I should have taken a handful), took a picture of the facade and saved the receipt for our scrapbook. We had a wonderful night and I wanted to save the memories, even the painful ones. Happy anniversary, honey! That is the coolest! I LOVE that you took a napkin. You should have snuck some nice flatware in too. George and I went to Wendy's for our 8th anniversary.